What role does your agent play in helping set up your book projects? (Selecting manuscripts to focus on and pitch, etc) How would an agent steer you if your house does not like a project you and your agent were excited to do? 1. Can you speak to the pros and cons of working with different-sized publishing houses? Is it worth going to the same publisher with new manuscripts if they’re consistently rejecting them? Hello, what should you do if you have an agent who is consistently not getting you a publisher for your manuscript? How do you cope with the anxiety/sadness when your writing career doesn’t go the way you planned? Any tips for producing a coherent pitch/proposal while you’re still peering into the fog of drafting? This is the wrong livestream. Hi Carolyn! Unfortunately, due to last-minute difficulties, Lydia Kang is unable to present her topic. 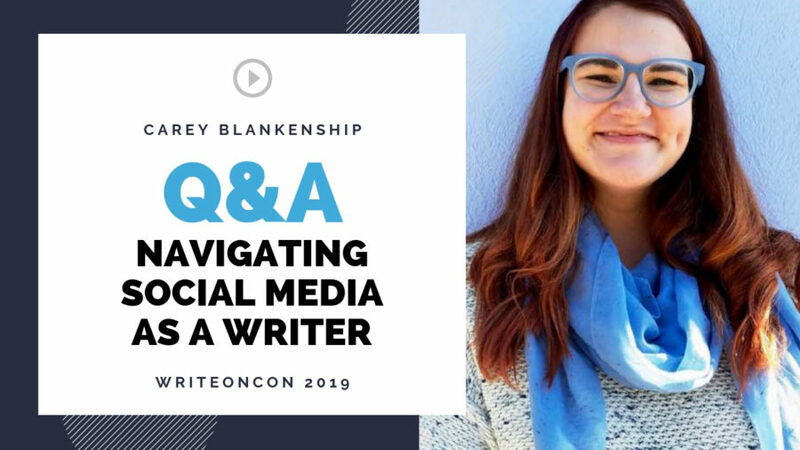 Carey Blankenship is presenting in her stead — feel free to ask her any questions you’d like about social media! Hi Carey! What is your biggest tip for people just starting out with a social media platform? CAREY! What sort of posts specifically do you see perform the best to drive engagement and audience building on Twitter? How do you recommend unpublished authors build a platform on instagram? Is it reasonable to start a platform before you even complete a draft? What are your favorite Twitter chats to participate in? Especially for growing your network? Nice work taking the stage! Social Media Part 2: Great that you could punt for the team and I appreciate you filling the space. I am very interested in SM and my largest issue is with the Amazon giant and the way they curtail engagement. I find that many people say they never see my posts that have my book or blog links. My friends and closest family members. It’s as if they have analytics to put up a wall against personal networking and this way they can promote their features for charging for ads. Not sure if I’m just paranoid, but it is something I’ve been very aware of on both my personal and author FB page. So far Instagram has not been as limited. What would you recommend by way of getting around some of these walls? Which social media platform do you think is best for building a writing platform? What are some pros and cons of the different platforms? Hi, Lauren. So sorry! Due to last-minute technical difficulties, Carey will be filling in. We hope you’ll stick around and ask any questions you might have regarding social media or marketing. Oh my goodness CARRIE! So excited to see you here! Can you talk about what types of content you think is best for building a strong personal brand? Is it good to post pictures on Twitter or is that just better for words? Do you consider sites like Goodreads, Amazon, and Wattpad to be social media nowadays? How valuable could have an active account with sites like Goodreads be for your writing platform? Hey, I’m trying to figure out how to view times of day in Twitter’s analytics. I could use some help? ? Oh, it’s in the raw data, but I have to add 5 hours to the times on there for some reason, haha. There are a lot of proof of friendships on social media. Do you have any tips on connecting with people in order to form a close relationship with someone who’s only on a computer? did you say “Linda” for instructions for creating social media?